San Pedro de Atacama has by far some of the most magnificent sceneries we’ve ever seen. If you are not travelling with a car, the best way to see these is by booking tours. There are multiple travel agencies in the main road of the town where you can find planned tours to the best locations for pretty affordable prices. However, this can be quite overwhelming as the choice of tours is huge. Before heading to San Pedro we did some research on the things we couldn’t miss, but we had to be selective due to our limited time there. After taking some of the most popular tours, we feel like certain visits are over-hyped whilst others are over-seen. In addition, many travel agencies don’t tell you that for most of the tours you will have to pay an extra fee on entry to the park, which in some cases was a bit expensive. 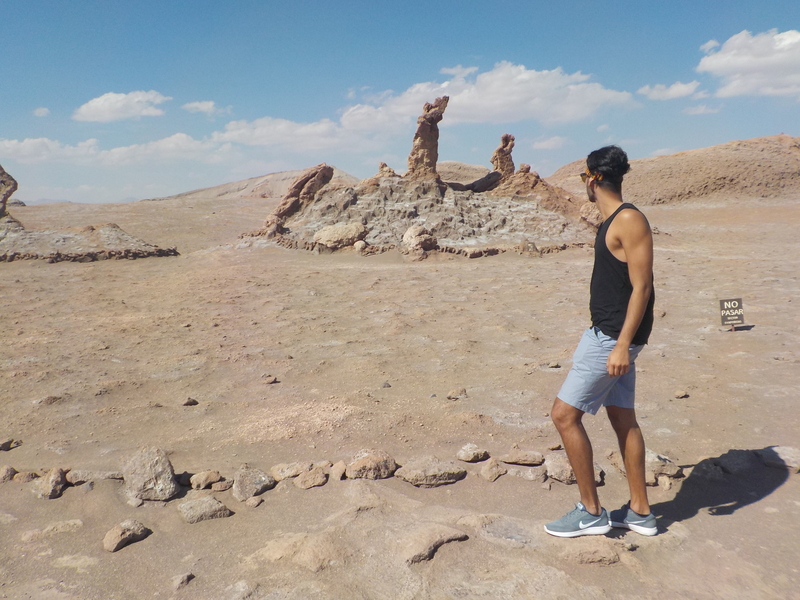 So to help you make a more informed decision when it’s your turn to choose, we’ve put together a list of the best tours in San Pedro de Atacama after evaluating those we took. This tour requires a very early start of about 4.30AM and a lot of thermic clothes due to the freezing temperatures, but it is totally worth it. This is the star tour of San Pedro, and we wouldn’t recommend that anyone misses it. The entry to this park was $10,000 Chilean Pesos per person, which is $16,7 US or £11,7 GBP. It requires a 2h drive from the town and it is 4,320 metres above sea level, so make sure you are well rested so your body doesn’t take a hit. In entry to the park you will be able to walk in between very impressive Geysers as the sun rises, which makes it an even more stunning setting. After you have explored the Geysers, you will be taken to a natural thermal bath, where you can immerse yourself in shockingly hot natural water that originates from the volcano. This is a very brave experience due to the negative temperature outside, but once you are in the water you won’t notice; and again, it is definitely worth it. Depending on the travel agency that you book the tour will have other stops on your way back to the town. We stopped in Machuca village and in multiple places along the way to explore the nature. We also managed to see flamingos, llamas and vicuñas (a chilean typical animal), all in the same trip. The Moon valley is one that is also very recommended on the internet, especially because of the sunset views. However, we found a lot more impressive the valley itself during the day than the actual sunset, but if you book a tour both should be included. Before traveling to San Pedro we read online that it is the best place to stargaze in the Southern Hemisphere due to it’s clear skies and temperatures. We had never done something like this before so it was very appealing. There are only a few agencies in town that provide this tour and probably not many observatories, so not many people go ahead with it, or at least not as many as go do the rest of the tours. However, the pictures in the internet don’t make justice to it, I have never seen stars and planets like I saw them that night. The sky was amazingly clear and it was a completely different experience. We saw the milky way, Jupiter and many other famous stars. We almost missed this tour as the time (at night – there are 9PM, 11PM and 1AM sessions) is a bit inconvenient as we were tired, but I am glad we went. Our trip to San Pedro wouldn’t have been the same without this tour. Laguna Cejar – We actually visited this famous salty lagoon. You can see it in our video in minute 1:40. It also was a lovely tour but it didn’t make it into the top 3 because even though it is cool to float in the lagoon, it didn’t feel like something out of this world like the rest of the tours. In addition, the entry fee is $15,000 Chilean Pesos per person, which is $25US or £18GBP. The tour also took us to see some massive salt camps where we watched the sunset for an additional $2,000 Pesos fee. You can absolutely do this tour if you have time and money, but I wouldn’t make it a priority. Tours to Bolivia – In San Pedro many travel agencies will offer 3 day tours to Bolivia, which also looked amazing if you have time! Sand-boarding – This activity was offered by also many agencies and we wished we had have the time to do it. It looks so much fun! We hope you found this review useful if you are travelling to San Pedro. Feel free to also ask questions in the comments! If you have been to San Pedro, which tours did you take and which ones were your favourites? Leave us a comment below! Can you share the company you used for Sandboarding? Also were you able to pair with a tour of Moon Valley? Hey we didn’t do sand boarding sorry! But I don’t suggest you book in advance. Once you arrive at San Pedro you’ll find all the agencies in the Main Street and you can book 😊. If you want to do a trip to Moon Valley during the day you won’t be able to pair it up with anything else as it takes the whole day. However if you only want to see the sunset you might be able to find it when you book the sand boarding. Good luck with your trip!! Thank you for the suggestions and info! You list the entry fees for the parks, but about how much were the tours themselves (in CLP)? Asking for a ballpark figure for half-day and full-day tours..
Glad you found the information useful! Some tours are more expensive than others. On average they’ll be between 25.000 and 40.000 CLP each. I think we managed to negotiate 3 full day tours for around 80.000 CLP for buying all of them with the same agency. Hope that’s helpful and good luck with your trip!